Ahi Hybrid Surf - our version of the performance hybrid fun board from Kevin Seid Designs / Shapes: designed for easy paddling yet has the feeling of a shortboard. Multi-fin options from thruster to quad that will give you great performance and the ability to customize the fin setup to whatever kind of surf is happening that day and given your unique abilities. Works well from knee high to solid overhead. A great all-around travel board. Order one today 2-6" longer than your shortboard. Pictured: 6'7" x 19 3/4" x 2 1/2". 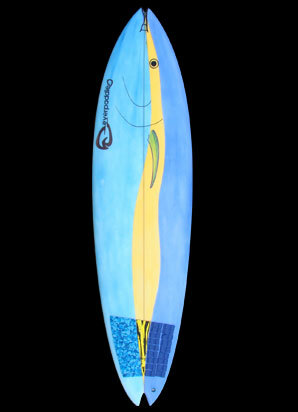 Eco-epoxy construction and 100% recycled foam, certified by sustainablesurf.org. A portion of all our Ahi series boards goes towards the education of sustainable seafood harvesting. Prices start at $590. Call 808-371-9686 or email us to dial in your own! © 2010 Everpaddle. All rights reserved.